27 September 2012: DECC’s latest issue of Energy Trends follows up from national Combined Heat and Power (CHP) dataset, published in July’s Digest of UK Energy Statistics (Chapter 7) (see also CHPA’s press release for further information on this), to present the data in a regional format, providing some detail on the use of CHP in London. The article – Combined Heat and Power in Scotland, Wales, Northern Ireland and the regions of England in 2011 – can be downloaded here. A number of things can be observed. Table 1 highlights that there are 212 CHP schemes in London currently registered with the Government’s CHP Quality Assurance programme (more details at www.chpqa.com). This means that these generation plant have provided details of their operation to the QA programme and qualify for the benefits of being classed as ‘good quality’ such as exemption from the Climate Change Levy. A full list of where these 212 schemes are not unfortunately in the public domain, however, DECC do keep a subset of these schemes (32 listed at the time of writing) on their CHP database (run the region report for London). Additional schemes should also be able to be identified on the London Heat Map. Note – there are likely to be more than 212 schemes – small scale (say around 100kWe and below) CHP engines may not bother registering with the CHPQA as the financial benefits of the CCL exemption may only be modest for such plant. 409 GWh of electricity were produced by these 212 CHP schemes in 2011. 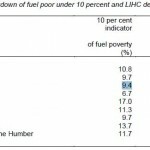 This represented 1.8% of the total CHP-electricity generated in England, and only 1.5% of electricity generated in the UK. Table 2 however appears to show that, since 2009, there has been a net growth of 50 CHP schemes in London (ie some CHP plant may have been decommissioned – the actual number of new plant isn’t provided – only the net figure of 50). There has been a considerable revision of the numbers since last year’s dataset (for which, see story here) which reported that 188 Good Quality CHP schemes were operational in London as at the end of 2010, as compared with the 158 seen in the table above. Overall a confusing picture! 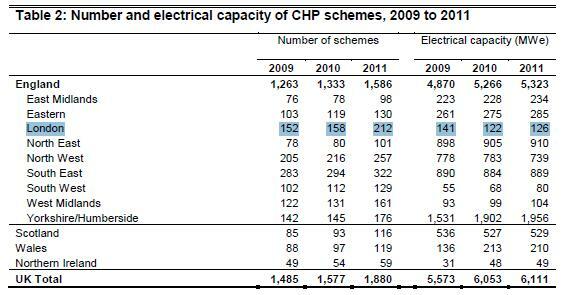 Last year’s article indicated that there was 185 MWe (electrical capacity) of CHP operating in London in 2010. In contrast, the revised numbers today state only 122 MWe for the same year (2010). The latest data now reports that only 126MWe of CHP electrical generating capacity in London in 2011. Hence, whilst this latest data indicates a 4MWe increase in 2011 compared to 2010 all previous reports have indicated that approximately 200MWe of CHP capacity operated in London. Hence, this latest data suggests that there is in fact far less CHP operational in London than previously thought leading to a considerable downward revision! The 2011 statistics also report that this 126 MWe of CHP produced 409 GWh of electricity and 1,074 of heat GWh heat – a total of 1,483GWh energy in total – a drop by almost 50% of what we thought CHP was generating in London in terms of heat and power up to today as a result of previous DECC datasets. All in all, this does little to help the achievement of London’s 2025 25 per cent decentralised energy target – which is estimated in the Mayor’s Climate and Energy Strategy as a total of 23,500 GWh of energy [p86 – see chapter 4 of the Strategy for further information]. September 2012: The Renewables Roadshow will be at Wembley Stadium on 3 October 2012 and features a large number of energy efficiency and renewable energy company products and exhibitors. Apply for free tickets at renewables-roadshow.co.uk. The showguide can be downloaded here [16MB document]. 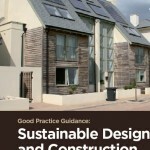 September 2012: ‘Good practice guidance: sustainable design and construction’, has been put together to support local planning authorities’ in their statutory duty to contribute to the achievement of sustainable development, of which sustainable design and construction is an integral part. 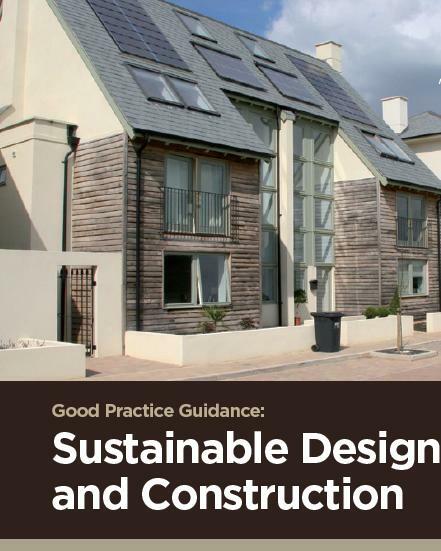 This guidance has been produced for use by local planning authorities in England, together with landowners, developers, businesses, town and parish councils, community groups and others. Download the guidance document here. September 2012: Camden have published new guidance for home owners in Dartmouth Park who want to make changes to improve the efficiency of their homes. Camden says that the “guidance shows that historic homes of the types found in Camden’s conservation areas can be made more energy efficient, often through relatively minor and easy changes, and still retain their special character and appearance. Where major energy efficiency measures are required, the guidance sets out how and where these are likely to be acceptable”. It may be acceptable on the side elevation of a building depending on the prominence of this elevation and the presence of architectural features. Many rear elevations are visible from the street due to long views along the rear of terraces and an approach which preserves these views will be expected. This will usually mean that external insulation to the garden level will be acceptable, but not upper storeys. A comprehensive street-by-street breakdown of what will be acceptable in terms of energy efficiency improvements is then provided (!) and pages 33-36 provide further guidance on specific aspects of EWI. September 2012: Recent parliamentary question in the House of Commons provides a useful summary on where London housing statistics are kept and collated. Statistics on new housing starts and completions in each local authority in London, taken from the National Statistics on House Building, are published in live table 253 on the Department for Communities and Local Government’s website which is available on the following link. These statistics show starts and completions split by tenure according to whether the organisation responsible for the development is a private company, a housing association or a local authority. The figures for housing associations and local authorities can together be used as a proxy for affordable housing starts and completions. However, these figures may underestimate affordable housing supply and overestimate private housing, as they are from building control records in which the ultimate tenure may be difficult to identify. Statistics on the full extent of affordable housing supply by local authority are published in the Department’s live tables 1006, 1007 and 1008, which are available at the following link. From 1 April 2012, the Mayor of London has had oversight of strategic housing, regeneration and economic development in London. September 2012: The Retrofit for the Future programme’s Low Energy Buildings database website has recently been updated. The database is a repository of low-energy building information created to help inform the planning and development of low energy new build and refurbishment. The website allows users to browse projects in the database, and create and edit projects if you have a log-in. A projects map highlights schemes funded across the UK and direct links to the 11 London based retrofit schemes follow below. Further information on the ‘Retrofit for the Future’ programme and evaluation of the projects submitted can be viewed here. September 2012: The UCL-Energy Institute runs free, public events throughout term time on a wide range of energy related topics. Full details of forthcoming seminars are listed here. September 2012: The Energy Saving Trust (EST) are launching a new package of support to prepare SMEs based in London for the upcoming Green Deal and Energy Company Obligation (ECO). Full details of all three stage workshops are detailed here.